WOW! This week flew by and here we are at Wednesday again! The quilt binding is sewn on the Sunshine & Cloud yellow and gray quilt from last week and the custom wedding quilt is being quilted. 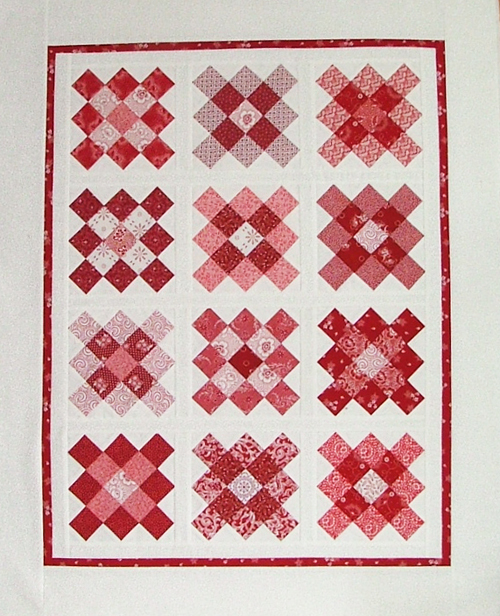 I cut the left-over fabric from the wedding quilt into 1.5" and 2" squares and set them aside and while browsing some of my favourite quilting blogs, I found this picture of the Granny Square quilt block done up in red and white fabrics from Auntie Em at Quilt Crossing. This will probably be a WIP for a while, as I have several other projects that I need to finish, but this one may not let me ignore it for long! 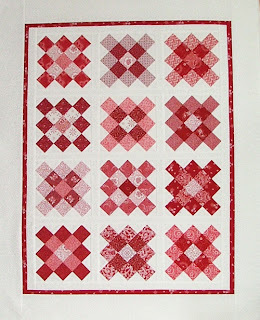 I don't have enough squares for a full-size quilt, but I see this one as a picnic quilt or a lap quilt for sitting on the front porch on a cool evening. So, that's what's keeping me busy this week! What are you working on? Have you ever had a project not want to go the way you thought it should? oooh, that top red one really calls my name. Very nice! I have been playing with the granny square blocks and have a stack of 20 put together --- I actually haven't thought about putting them together into a quilttho... one day perhaps... The sampler looks quite excellent! Lovely sampler - it is each time again surprising to me what a difference sashing and border fabric choices can make on a quilt. Love your sampler. Very nice. I think you made the perfect choice for the fabric for the sashing. It's going to be lovely when it's finished. I laughed when I read your question..... I'm a happier person, in general, since I started embracing the unexpected in my work. I guess that's my way of saying most of the time things don't go as I anticipated....but sometimes they turn out better....so I'm trying to learn to go with the flow. I love the 2 blocks on your design wall. They're really pretty.